We predicted that the SCOTUS ruling in Masterpiece Cakeshop, despite being extremely narrow, would embolden others to challenge discrimination laws protecting the LGBT community. It certainly emboldened Jack Phillips—the baker in Masterpiece Cakeshop who refused to make a wedding cake for a homosexual wedding. 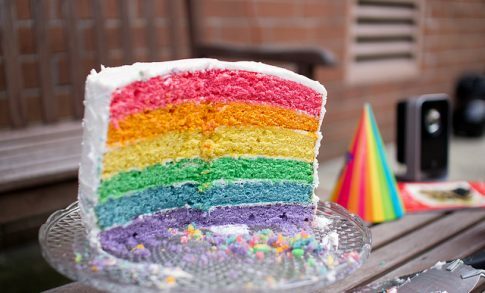 He’s suing Colorado saying that they are discriminating against his religious beliefs after he refused to make a cake celebrating a gender transition for a trans woman. He and his lawyers have made public statements that their highly publicized lawsuit has made them a target of the Colorado government. Indeed, they certainly have had a higher level of notoriety in the public eye. However, the situation itself isn’t so cut and dried as there appears to be a legitimate case that Mr. Phillips’ cakeshop refused service based on gender identity. For those unfamiliar with Phillips and the recent Supreme Court ruling surrounding his actions, Phillips refused to make a wedding cake for a homosexual couple claiming his religious beliefs are that homosexuality is wrong. He argued that his cakes were a form of First Amendment protected speech and that making him make a wedding cake for a gay wedding violated his Free Exercise of religion as guaranteed by the First Amendment. Whether the Colorado law was unconstitutionally forcing Phillips to act against his religious beliefs. Ultimately, the ruling did very little but potentially embolden others to justify discrimination as religious belief. It certainly didn’t come anywhere near ruling that Colorado’s discrimination laws are unconstitutional. However, Phillips’ new case—with facts that developed even as the Supreme Court case was ongoing—is seeking an explicit ruling along these lines. The situation giving rise to Phillips’ case began in June of last year on the very day the Supreme Court agreed to hear Phillips’ first case. Phillips’ bakery received a call from a woman named Autumn Scardina—a Colorado lawyer. She asked for a cake with a pink interior and a blue exterior for her birthday, and to celebrate the anniversary of her transition from male to female. Apparently, on the phone, the woman was happy to make the birthday cake until Ms. Scardina mentioned her gender transition. At this point, she was told that they do not make cakes celebrating gender changes. Ms. Scardina filed a discrimination complaint with the Colorado Division of Civil Rights. A few months back, days after the Supreme Court ruling on Phillips’ first case, Colorado finally determined that there was enough evidence for a claim that Phillips’ bakery had discriminated against Ms. Scardina based on her being transgender by denying her equal enjoyment of a place of public accommodation—a violation of Colorado law. As a result, they required the two parties to enter mandatory mediation of the issue. Phillips has responded to this with a lawsuit against the state of Colorado saying, once again, that their anti-discrimination laws violate his free exercise of religion. Phillips has publicly stated, “I know the Bible says that God created male and female and that we don’t get to choose that, and we don’t get to change that…And I don’t feel like the government has a right to compel me to participate in creating a cake that promotes that message.” As we mentioned in previous articles, the state almost certainly does have that right so long as the law itself applies the same to everybody. Regardless, Phillips filed his case in Denver Federal District Court recently. He is demanding a ruling which offers an injunction permanently preventing Colorado from enforcing their anti-discrimination laws against him specifically and a whopping hundred grand in punitive damages. It will be interesting to see where the case goes. On its face, the legal arguments don’t seem to favor Phillips. He certainly has made himself a bit of a target for customers seeking to test the limits of Colorado’s anti-discrimination law. However, this doesn’t mean he should be personally immune from discrimination laws. His argument that he is the target of religious persecution is a very serious allegation. What he faces just doesn’t seem to legally constitute this sort of persecution.